Lindai is a medium-sized Ayleid ruin east of Chorrol containing undead (quest-related). It contains two zones: Lindai and Lindai Inner Tombs. 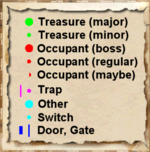 This ruin can only be partially explored before the related quest, since a key is required to access the final portion of the second zone. Another option is to have a very high Acrobatics skill (see here). This location's map marker (M on map) is named Lindai (editor name LindaiMapMarker). The entrance door is NW of the marker, 70 feet away. You enter this zone from the Out door and can reach the second level, Lindai Inner Tombs, only through door C. Door D is located on a higher level than the rest of the zone and is better used as a fast-track from the second zone. With a very high Acrobatics (in excess of 100) it is however possible to jump onto the ledge and use this door. This is the only way to access the zone containing the Ayleid Crown without starting the related quest. This zone is infested with enemies and traps. Many of the enemies are clustered together and you may find yourself fighting against up to four enemies at the same time. A first taste of what lies ahead are the two Swinging Blade traps found at F, just after entering; although you might also be able to use them against the enemy close by. 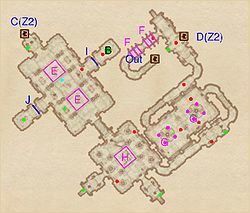 In the second large room are eight Gas Traps (G), which can be difficult to avoid while fighting against the undead in the same room. In the third room you will find a Spike Trap (H) waiting for you. In the final room you will find three Ceiling Spike traps (E), positioned in the middle of the room, although only the outer two will cause you any damage. You may also be able use them at your advantage against the enemy found here. The activation switch (cyan dot on map) for the two Iron Gates (I and J) is found on the ceiling and can be accessed by staying on one of the sides of the trap as it raises upwards. Behind gate I you will find the Boss Chest (B) and a single enemy, which can be easily killed through the hole in the gate by using ranged attacks and spells. 11 Welkynd Stones: four are found high up on pedestals (see the article for tips to reach them) in the southernmost room while other seven are in the final room on easily-reachable pedestals. 2 Iron Gates (opened remotely) at I and J. Both gates are opened by an activation switch on the ceiling (cyan dot on map). To enter the final part of the zone you will have to open the carved stone door at E using the key that you are given during the quest. The key will be removed once you open the door. Inside the next room you will find the Boss Chest (B), the chest containing the Ayleid Crown (Q) and a boss-level Undead (A) guarding them. There are also two Varla Stones (V); the activation switches for their cages can be found on the sides of the room (cyan dots on map). You can then use door D as a fast-track to the entrance of the first zone. Lindai may be inaccessible after a few visits. ? This page was last modified on 3 June 2017, at 18:36.